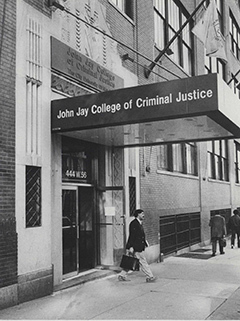 John Jay College of Criminal Justice was born in the mid-1950s. The catalyst for the school came from growing concerns on the part of civic leaders and the New York City Police Department over increased complexity of police work in the administration and operation of the department, and the ongoing relations between police and the community. 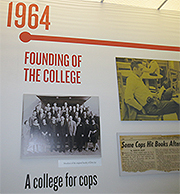 In response, a Police Science Program was established in 1954 at the then Baruch School of Business and Public Administration of City College. This program emphasized a strong liberal arts curriculum as the basis of a sound police education. Over the next decade, the program grew substantially, attracting large numbers of students. The school's namesake, John Jay, was the first Chief Justice of the United States Supreme Court and one of the founding fathers of the United States. Jay was a native of New York City and served as governor of New York State. Today, John Jay is one of the nation’s premier criminal justice and liberal arts institutions. The college brings together Pulitzer Prize-winning faculty and undergraduate/graduate students in diverse liberal arts disciplines to engage with issues of justice and diversity.